Know Everything and Control Everything: 2 Apps to Try | Ooh Something Shiny! Here are a couple of the latest (Yay! Free!) apps that I’ve tried. No surprise that I found them through Lifehacker. The first is Circa. 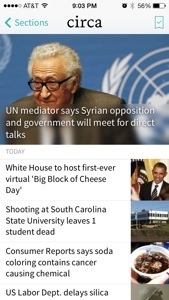 (iPhone or Android) Circa is a news aggregation site (with Real news even). You can stay with the Top Stories default or check out national or world news, politics, technology, science and health. It’s easy to share stories through social media, email, even text. The best part? If you find a story of interest, you can set the app to send you updates. I like this one so much that I gave it a spot on my first page of apps. 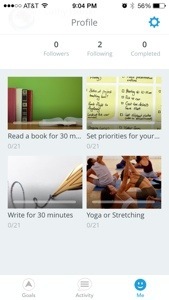 Lift is perfect for those still procrastinating on New Years resolutions. Create good habit by persisting 21 days. Choose from a list of habits or choose your own. Set reminders, find friends on Twitter to follow or join a discussion group. I just started this one, so I’ll have to update you in three weeks. Anyone else have apps to try? I’m a big sucker for new apps.